WIMA has developed a customer-specific storage unit based on double-layer capacitors for the energy storage system of one of the world's largest manufacturers of construction machinery headquartered in Germany. The energy storage presented at the PCIM 2018 in Nuremberg is ideal for storing cyclic, excess, regenerative energy and releasing it again when needed. The storage is used in mobile or stationary diesel-electric drives, e.g. in process engineering, in lifting and driving applications as well as in mechanical engineering. 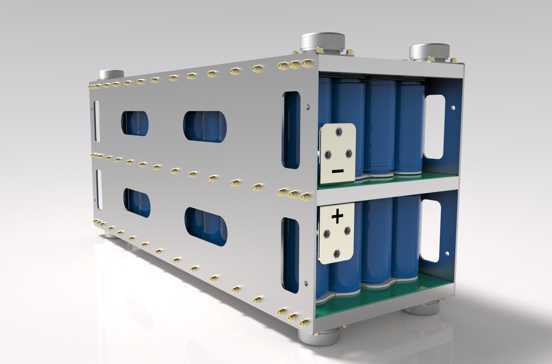 The energy storage is used to reduce the internal combustion engine by peak load coverage, the reduction of the grid connection power, the heavy load start, the use of recuperation energy and thus the reduction of fuel consumption and pollutant emission. The memory unit has a capacity of 31 F and a nominal voltage of 259 VDC. The system has a modular design so that several units can be interconnected depending on the energy requirement. Further advantages are the short charge-/discharge cycles and the long service life compared to battery-based systems.